Sleek, stylish, confident—Shanghai certainly makes an impression. Its steel skyscrapers look like rocket ships ready to blast off into the future, taking China along with it. 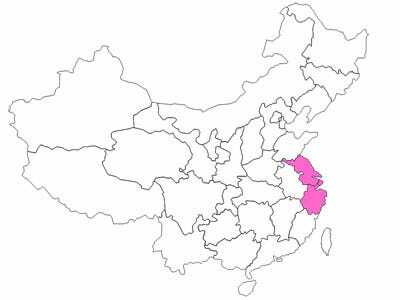 Shanghai is a very young city by Chinese standards, but the Yangtze River delta—known in ancient times as the kingdom of Wu—has always been the most commercial and cosmopolitan part of China. Like the Low Countries at the mouth of the Rhine, it is a flat watery land crisscrossed by busy canals linking a constellation of trading cities. The Back Door may succeed in breaking the rules, but only the Metropolis has the wealth and dynamism to entirely reshape them. Its treasure fleets nearly discovered Europe a century before Columbus sailed, and of the Nine Nations, it is the only one to have displaced the Yellow Land—several times—as China’s political capital. The Metropolis likes to see itself as China’s bright and beckoning future, but the feelings it stirs in other parts of China are decidedly mixed. While its residents see themselves as adaptable and forward-thinking, to many Chinese they come across as arrogant city-slickers—cliquish, crassly materialistic, and slavishly eager to mimic foreign ways. Shanghai had a pre-war reputation as a neon-lit version of Sodom and Gomorrah, and when China was “Red,” the Metropolis paid dearly for its “Black” capitalist past. Consigned to purgatory for over 40 years, the region bore the brunt of the Cultural Revolution and was starved for development funds—essentially frozen in time—until the early 1990s. The rebirth of the Metropolis did not take place on its own terms. It was the result of a political decision, made in Beijing, to transform the region into a carefully designed showcase of what China could achieve. The state has poured tremendous resources into industrial parks, infrastructure, and Shanghai’s glittering new financial district, attracting huge amounts of foreign direct investment. But this subsidized, scale-driven growth model—where bigger is always better—makes for an economy dangerously prone to speculation. The best hope for the Metropolis lies not in ever-greater capacity and ever-taller buildings but in smaller, nimbler, entrepreneurial enterprises that draw on the region’s distinctive flair for marketing, design, and fashion.